At home testing method is very common now, but you need a durable medical equipment which can do the job. With countless blood glucose meters on the market, how do you know which one to choose for blood glucose monitoring and testing? Do you choose the most expensive one; it must work the best if it costs the most, right? Or are you a techie looking for a Bluetooth meter that syncs to your smartphone? Perhaps, you’re concerned with the cost and you’re looking for the most affordable meter. How does one look for the right monitor with the high standards you may have? 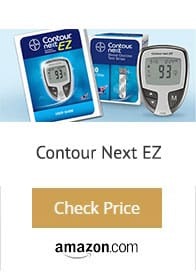 After a careful review of the top glucose meters on the market, our #1 recommendation is the Contour Next EZ. It’s simply one of the best in terms of functionality and price. Click here to read 700+ positive customer satisfaction reviews, including the common customer complaints that may be of concern to you. The Contour Next EZ is great for people with diabetes or anyone new to blood glucose testing or for those who don’t need all the fancy bells and whistles on a monitor. The display screen is not backlit, therefore, it may be hard to read in poor lighting. The entire meter fits well in a hand coming in at just over 3 inches tall and about 2 inches wide. Even though it’s not the tiniest meter on the market it doesn’t weigh much, only 1.7 ounces with the two 3-volt coin-cell batteries installed. The Contour Next EZ is very accurate. It uses 0.6 microliter sample and reruns the test 6 times, using multipulse technology, to ensure the best result. Even though the sample is run several times, you will get your result in just 5 seconds. The meter’s retail pharmacy price is $19.99 and the test strips are very affordable at just $0.83 per strip. The basic Contour Next EZ does not have Bluetooth technology however you can download Bayer GlucoFacts Deluxe free software for your PC or Mac and link the two via a data cable. Bayer also offers helpful meal planning tips and how-to videos on the software program. A con to this meter is that it requires a fingertip sample, you cannot sample from any other alternate site. It’s available on Amazon. Learn more here. Click here to read third party reviews. 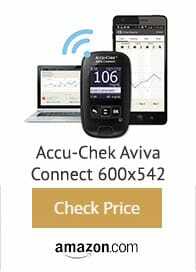 The Accu-Chek Aviva Connect gets its name from the Bluetooth connection that syncs to the user’s smartphone. The Connect utilizes an app to keep track of both short-term and long-term readings on a person’s smartphone. The user can also view their trends via bar graphs and maps on the app. The Accu-Chek Aviva Connect will cost you $29.99 and $1.75 for a single test strip. One con to this meter is that the test strips are one of the highest priced strips on the market. However, they are readily available in almost all drug stores and pharmacies. Accu-Chek also offers a supplemental program called Preferred Savings which can reduce most test-strip co-pays to $15-$45. Other additional features include an easy to read backlit LCD display, easy testing in just 3 steps, and this glucometer weighs just 1.4oz with batteries. Speaking of batteries, the Connect takes two 3-volt coin-cell batteries. To test with the Accu-Chek Aviva Connect simply insert the test strip, lance a finger then touch the test strip to a small drop of blood, 0.6 microliters to be exact. It takes 5 seconds to receive your results. The actual medical device stores 750 blood glucose readings, but with the Connect app, you can store unlimited readings on your smartphone. The Accu-Chek brand has a long history of providing blood sugar meters to those with diabetes. 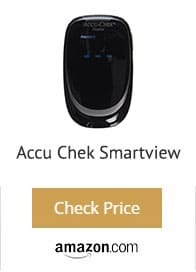 In fact, one user with diabetes for over 30 years can attest that the Accu-Check Aviva Connect is one of the best she’s ever used. The ability to transfer the data stored on the meter to your iPhone or Android device is wonderful. The Accu-Check Fastclix lancing device that comes with the meter offers even more benefits. It is able to store up to 6 lancets per drum. You will never have to worry about accidentally poking yourself while changing your lancets because they are all stored in a safe lancing drum. You don’t have to change them out each time you test either. Each drum gives you up to 6 testing’s before it needs to be changed. The OneTouch Ultra 2 has the lowest co-pay on most health insurance plans. And if you have Traditional Medicare Part B this meter won’t cost you a penny. Without insurance, the OneTouch Ultra 2 retails for $19.99. This glucometer is dated, meaning it still uses coding and does not have a high-contrast display. Coding means that the user has to enter the code on the side of the test strip vial before testing their blood. This adds a step to the process and takes a few more seconds than most models on the market today. A few more drawbacks of the OneTouch Ultra 2 are that the test strips cost, on average, $1.32 per strip and it requires a large drop of 1.0 microliter blood sample to test. The Ultra 2 holds 500 readings in the device’s memory function. It runs on one 3-volt coin-cell battery. 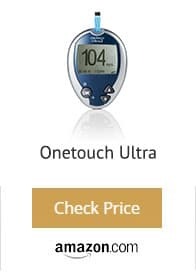 The OneTouch Ultra 2 does offer software to track your glucose readings, however, you must use a computer operating with Windows system and you must connect the meter to your computer with a specific OneTouch USB data cable. Buy yours today on Amazon for the best price. OneTouch Verio glucometer is excellent for those with sight issues having troubles testing their blood sugar levels. The large, backlit screen is very easy to read. The Verio uses ColorSure technology to effortlessly view a red dot, meaning your reading is above average, a green dot, showing your reading is within the normal range, or a blue dot, indicating your blood glucose reading is below average. The screen on the monitor also tells you your averages over the past week, two weeks, and thirty days. The OneTouch Verio also holds up to 500 past test results in the device. The Verio has been proven to be over 99% accurate with its results. Accuracy is one of, if not, the most important aspects to consider when selecting your glucometer. 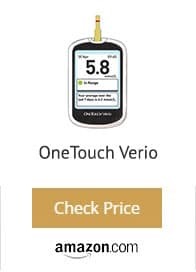 The price of the OneTouch Verio is very fair at $19.99. Test strips are on the high end at $1.66 per strip. However, the strips are completely covered by Traditional Medicare Part B and have the lowest co-pay on almost all health insurance plans. The meter requires 2 AAA batteries, which costs a little less than most meters that use the 3-volt coin-cell batteries. The blood drop of small sample is required, coming in at 0.4 microliters. Also, the strips do not require coding. While the OneTouch Verio does not have Bluetooth capability, it does have the ability to link with the OneTouch Reveal web app via a cable connection to the user’s computer. Setting up the program is a little tricky because you must also download and install the OneTouch Data Transfer Tool. There is support available on OneTouch.com for those who are not tech savvy or have trouble setting up the web app. If you’re looking for a bargain for self-monitoring of blood glucose, try the Wal-Mart ReliOn Confirm. This meter is a good option for those without insurance, or who are pre-diabetic and do not have insurance coverage for diabetes meters or supplies. According to one user, this is a great option for those with diabetes of all ages, including children. One user that has type 1 diabetes and uses an insulin pump for glycemic control, this meter should definitely get more attention. While it’s a basic blood sugar system, it provides the same accuracy levels when compared to others, at a much lower and more affordable cost. For those without insurance coverage, this might be the best option for you. The ReliOn Confirm costs only $14.98 and test strips cost on average $0.40 per strip. These are some of the lowest priced strips on the market, and they do not require coding, which is a plus. Another plus is that the blood sample is only 0.3 microliters. Like most glucometers, the Wal-Mart ReliOn Confirm takes one 3-volt coin-cell battery. 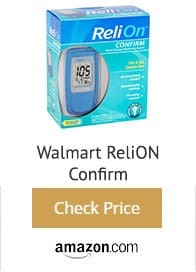 There are several reviews on Walmart.com stating that the ReliOn Confirm does not offer accurate readings however based on my experience it’s one of the most accurate devices in the market, we suggest you try and test for accuracy yourself. There is also a control solution that is not included but can be purchased for an additional cost of five dollars. The solution is recommended to ensure accuracy. While its available in Walmart, I suggest you get yours for the best price here. Are you a busy, on the go person? The FreeStyle Lite is one of the best BG monitors. It’s one of the smallest units and weighs only 1.4 ounces with its one 3-volt coin-cell battery inside. It gives you the flexibility to test anytime and anywhere because it has a backlit display and port light for test strips. The blood sample is only 0.3 microliters, you can sample from your upper arm, fingertip, or palm. However, the fingertip provides the best results. Test strips are a little costlier for the FreeStyle lite, coming in at $1.46 per strip. One benefit of the FreeStyle Lite is that their ZipWik tabs allow for faster and simpler blood collection. Users see results in 5 seconds. One user likes that the FreeStyle Lite glucose meter is easy to use and easy to read. A smidgeon of blood is all that is needed. Using this system is quick and painless as well as highly accurate! Some cons of this meter are that it does not have Bluetooth connectivity but does work with downloadable FreeStyle Auto-Assist software for your desktop. Also, if your diabetes affects your sight, this model is not for you because the display is only 0.7 inches. 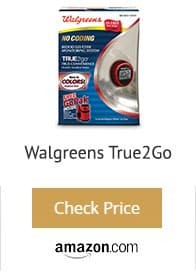 Walgreens True2go is very affordable. Priced at $9.99, it’s at best value. True2go is also fast; with triple sense technology, you get your results in 4 seconds. Test strips do not require coding and the sample size is only 0.5 microliters. This meter also stores up to 500 results with the date and time. True2go is tiny, about the size of a quarter! It fits easily into a pocket or purse. Another unique added feature is that it’s made to twist onto the top of a test strip vial. If portability is what you need then Walgreens True2go will be perfect for you. One user was a little disappointed in the results of this meter. The main reason for purchasing the True2go was to have a more convenient and portable option to take with her on the go. However, she confirmed that her results were running 20-25 points below what her Freestyle meter was reading. She then confirmed with 4 separate tests on various Freestyle meters and all were within 4 points of each other. This left her questioning the accuracy of this meter, which can honestly be dangerous. Another downside was she had to use three testing strips before it would even read a result. While the smaller size is a huge plus, unfortunately, the accuracy issues is an even bigger downside that could potentially lead to severe periods of hyper or hypoglycemia. She has a point, if it’s not accurate then it isn’t reliable. Again, we recommend you try this for yourself and determine if you find it accurate or not. 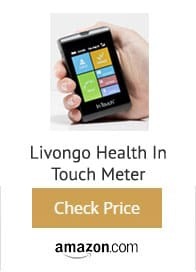 Livongo Health offers their very own In Touch meter, unlimited testing strips, online support from diabetes health coaches, and a mobile app that tracks your test results all for one easy $75 monthly fee. Livongo Health has completely changed the Diabetes testing industry. The In Touch meter fits in the palm of your hand and has a large digital touchscreen, similar to a smartphone. There are no reusable batteries to mess with, there’s a rechargeable lithium ion battery and cord included to charge it. What are Basal Rates of Insulin? The meter does require charging every night. Another negative is that the test strips require 0.8 microliters of blood and take longer than the said 5-second results would take. However, if you’re into technology, this meter is definitely for you. With the touch of the screen, you can contact and send results, via Bluetooth connection and your smartphone, to your own personal coach. Your coach will then text message you with information about your results and help you improve your numbers. Another plus is that some insurance providers are starting to cover the Livongo Health In Touch program. It’s worth a shot to contact your health insurance provider to find out if it’s a covered benefit. As far as portability, there’s a lot to carry around with the In Touch meter. The meter itself is large, test strips also are not small, and the case to carry everything in definitely doesn’t fit in a small purse. But again, this meter is great for those of us who are into the latest technology. The Nova Max Plus not only checks blood glucose but also determines if ketones are present in the blood. For the blood glucose test, the sample size is 0.3 microliters and for the ketone test, the sample size is 0.8 microliters. The blood sample can be taken from the palm of a hand, forearm, or fingertip. 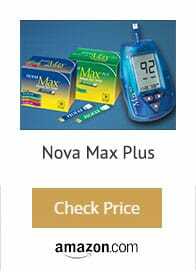 The Nova Max Plus retails for $19.99 and the glucose test strips are $0.40. The ketone strip will run you $2 per strip. There is no coding required for the strips. One 3-volt coin-cell battery is needed for this monitor. The not so small screen text is easy to read but it is not backlit and can be hard to read in poor lighting conditions. Another downfall is the monitor requires a control solution but it is very hard to find the control solution in stores. If you call the company, then they will mail out the solution, but this takes a few weeks. Another con is that the memory cannot be cleared and there’s no way to transfer data to a smartphone or computer. Overall, if you need this to check ketones it works but you’re going to be paying a hefty price to check them. As far as a glucometer, again, it works but it’s very basic. I had a nano and it was great for travel. If you buy the testing kit, it comes with free lancets and the lancet device. The thing with this bg meter is that you will have to buy test strips as most of the package deals are without the strips. Our Rating – 3.0 out of 5 stars. You can find in most pharmacies. I have removed most of the additional information for this one because I’ve updated the list. The Sanofi iBGStar is another great meter for the tech-savvy. It can be used on its own or plugged into the user’s iPhone. However, recently with the changes to the iPhone (removing the headphone jack), you need a special plug for this meter to work with the iPhone. The Sanofi iBGStar is one of the most expensive meters on the market at $74.99 (iPhone not included). Test strips are on the higher end as well at $1.30 per strip but do not require coding. The blood sample size needed is 0.5 microliters and the test results appear in 5 seconds. With the iBGStar the user can set up to 7 alarms to remind themselves to test their blood glucose. For a tiny device, it weighs 1.7 ounces including two 3-volt coin-cell batteries. The meter itself can hold 300 readings on its internal memory. When plugged into an iPhone you can use an app to track results and trends. This device is extremely portable; it comes with a 3 square inch carrying case. This device is not covered by most insurances. It is best to call your insurance company for a list of covered devices. After a careful review of the top glucose meters on the market, our #1 recommendation is the Contour Next EZ. It’s simply one of the best in terms of accurate results, functionality, price, and user-friendly. Click here to read 700+ positive reviews. It’s best to choose what’s most important for you. If you’re newly diagnosed and just need to get used to starting to test your blood glucose, then the Contour Next EZ is a great model to choose. 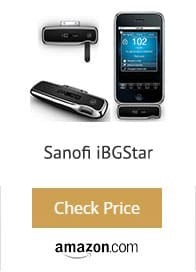 If you have an iPhone and are looking for some small and portable, try the Sanofi iBGStar. If cost is an issue and you need to rely on insurance to cover your testing strips look into the OneTouch Verio or the OneTouch Ultra 2. Even medical professionals do not recommend using price tag as an indicator of a good BGM. If you have insurance coverage, whether private or not, remember to call your insurance provider first to see what meters and strips they cover and ask how much the co-pays are. If you do not have insurance, the ReliOn Confirm is a great alternative. Please note that the expiration date for some testing strips applies. Make sure you look out for those otherwise you may get inaccurate results. Most of the BGM reviewed here fall within an affordable price range. For questions about any of the products, you can call their toll-free number and speak to a representative who can respond to specific product questions. If you are still unsure as to which one would be best for your needs, get in touch with your certified diabetes educator or a health care provider and see if they can help you with picking one. Please remember that to have readings that you will be satisfied with, it is important to follow your diabetes self-management on a daily basis as determined by you and your doctor! Not following your diabetes management may lead to unwanted blood sugar spikes within an unacceptable range. The accuracy of each BG Meter is based on the tests done by DiabetesTechnologySociety. What BGM would you recommend? Depending on what your needs are and what stanndard features are you looking for, that recommendation may differ. We recommend that you read as much as you can on the device that you are eyeing to buy and make an informed decision based on your research. Which brand is the most accurate blood glucose meter? How accurate are home blood glucose meters? As indicated above, home blood glucose meters can be accurate and we have listed the ones which have passed the accuracy test. How does one know that their Blood Glucose meter is working well? You will know that your meter is working well if you are not getting any random error messages and if your results are the same if you redo them. How can I get the most accurate results from my BGM? Before using the BGM for testing, wash your hands with warm water and soap. Dry properly and thoroughly. Don’t use alcohol wipes as they can diffuse the blood drop and make the reading hard to achieve. Which meter did consumer reports list as most accurate blood glucose? Can I get a free blood glucose meter? There are some brands which may give free meters to customers who cannot afford them. You will have to check with the brand to find out more. Where can I store my BGM meter and supplies? You may be interested in buying diabetes supply kit which can help you hold all your diabetes-related supplies in one manageable place. Can two different people use the same blood glucose meter? Two people may use the same blood glucose meter to record their readings, but it is strongly advised to not share any sharp or lancing objects in order to do the reading. What are the normal numbers for blood sugar level? For blood glucose, the recommended target reasonable ranges are 4-7 mmol/L before meals and 5-10 mmol/L two hours after a meal. Are you able to accurately diagnose yourself with a blood glucose meter for diabetes? A BGM is not to be used to diagnose for diabetes. The device is used to record and track blood glucose levels for the management of diabetes. If you are concerned that you may have diabetes, please see your doctor who can do a test in their clinic to officially diagnose you. Can I test myself for diabetes by using someone else’s blood glucose meter? Please do not share someone else’s BGM. The Centers for Disease Control and Prevention (CDC) and the Food and Drug Administration (FDA) have both clearly stated their position on sharing of lancing devices and it is a big no. If you are concerned that you may have diabetes, your doctor is the best person to test you for it. Can I share my blood glucose meter with someone else? How often should I change or replace my glucose meter? How long does a blood glucose meter last? If you’re diligent about properly maintaining your device, you will want to replace your blood glucose meter for diabetes every one to two years. What is the least painless glucose meter? According to documented cases of consumer reviews, Accu-Chek Multiclix causes the least amount of pain when used for testing. What is capillary blood glucose? It is another term for blood glucose. Do blood glucose monitors have an error? Why does my blood glucose meter keep giving me an error? It is possible to see an error message instead of numbers as results. There may be many reasons for why you see an error message, for example, using the wrong test strips will always give you an error message. Having low or high temperatures may give an error message. Reusing old strips or expired/damaged strips may also give error messages. Is there a way to calibrate my BGM? To ensure that your meter has the correct code to match the test strip, it is important to calibrate the meter. While some meters can code automatically, there are others for which you must code or calibrate manually. Calibration techniques may differ from a manual meter to an automatic meter. What diabetic test strips are covered by Medicare? Can you measure ketosis with a BGM? No – the BGM can only give results of your blood glucose levels. For ketone testing, you will need a specific ketone testing meter. Some BGMs do come with features that can help you test for ketones. How do you clean a BGM and is it mandatory to do so? The Centers for Medicare guidelines recommend that blood glucose meters be cleaned and disinfected after each use. One can clean the device by wiping with soap and water using a damp clothe or isopropyl alcohol. To disinfect your meter, you may want to use an EPA-registered disinfectant detergent or germicide. What will happen if my blood glucose meter strips expire? How do I know which ones I need? If your testing strips have expired, you will need to get new ones as old expired strips may interfere with the accuracy of your results. You will want to get the brand of strips associated to the make of your device. Every BGM has its own specific testing strip that works effectively when used together. How do I remove dried blood from the inside of my GM? If you have dried blood in the inside of your BGM, do not run it under water as it will damage the functioning of your device. If possible, make a solution of soap and warm water, take a cloth and gently wipe the blood off your meter. How do you clear the memory on a GM? Each BGM differs in terms of how you can clear memory off them. Some older versions may not even give you the option. However, the newer models and brands should allow you to clear up memory for new readings. Please follow the instructions on their package or their website to find out precisely how. What is the best BGM for children? According to our research, Bayer Contour NEXT would be the best option for children who have diabetes and need at home testing. It is affordable, effective and can hold up to 800 readings. Why does my blood glucose meter keep giving different readings? This is because the technology which is used for at home diabetes testing supplies are only capable of testing within a 10-20% +/- margin of error. What other several factors to consider when choosing a blood glucose meter? Does it give markers or flags? Can one test A1C with blood glucose meter? No – A1C testing is usually performed by your doctor at their clinic. The same taken by your doctor will be sent to a lab that uses an NGSP-certified monitor. There are at-home A1C testing kits that you can use to test the numbers. Is a blood sugar test different from a plasma glucose test? Yes – a plasma glucose test is also known as a fasting glucose test which helps to diagnose diabetes or pre-diabetes. It is performed first thing in the morning as the body needs to be in fasting mode when the test is being done. High glucose concentration can point towards several health risks, therefore its important that you get the test done if you suspect having diabetes. What are some glucose meters that don’t require blood? All blood glucose meters require blood for accurate testing. 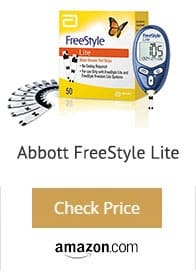 However, there is now the Abbott’s Freesylte Libre, a continuous glucose meter, available today in the market which does not require blood for giving similar results. Which blood glucose meter uses the least significant amount of blood? Most newer BGM today do not require a lot of blood for testing. The least amount required is 0.3 microliter, which most major brands will require to give you accurate blood results. You may want to test your glucose levels as frequently as based on your treatment regiment. Speak to your doctor if you are unsure of how many times should you test based on your individual circumstances. What is the best app to log my results? Glucose Buddy Diabetes Tracker and mySugr are some of the best-reviewed apps out there to help you keep track of your daily readings. What blood glucose meter has the least expensive testing strips? If you are not covered by insurance, try looking at ReliOn’s testing strips sold at Walmart. For those with insurance, it might be worth looking to Freestyle and Bayer programs for affordable options. Is there a way to determine blood glucose level without puncturing the skin to get blood? There are several testings being done with new devices which are less invasive than your traditional BGM. One such study, done at Princeton University, is looking at testing for blood glucose levels using a laser instead of a person pricking their fingers for blood to be used for testing. There are already continuous blood sugar monitors which don’t require finger pricking and which have been approved by the FDA. What is the difference between a blood ketone meter and a blood glucose meter? With a blood ketone meter, you will only find out if you have ketones present in your blood and in which amounts. With a BGM, you will be given results of what your blood glucose levels are. Each result is supposed to give you a picture of something different. Can a blood glucose meter indicate ketones? There are some brands such as the Nova Max Plus (reviewed above) which can also give ketone level results. When looking at BGM to buy, you will see if you can test for ketones as part of their features. How to test the accuracy of a blood glucose meter? You may want to test your blood sugar levels at the same time every day to see if the results are the same. This also assures quality control of the device you have purchased. How often do I need to charge my BGM or change its batteries? Depending on which meter you use, instructions on battery change/type and charging should be part of the instructions. As each meter varies in terms of functioning, you would be better off reading those instructions unique to your device. How much blood is needed for a glucose meter to work? Every BGM is different one or the other. The amount of blood needed will be indicated in the instructions package of the meter you are using. Some may require a little and some may require more. How to test blood glucose levels at home without a meter? To accurately test your blood sugar levels, you must use an at home testing meter. 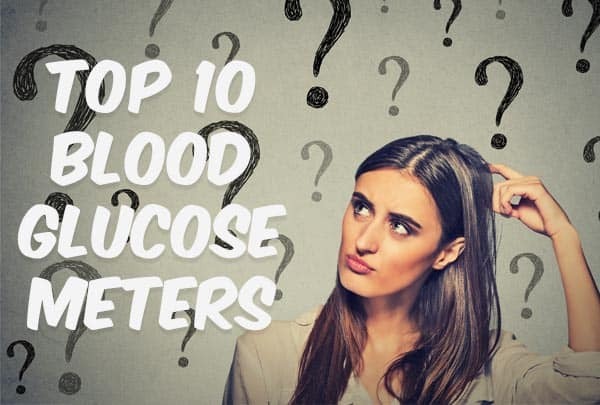 You may be able to tell if you are hypoglycemic or hyper with symptoms related to each, however, one can never be certain about their blood levels without testing them with a meter. How to safely dispose of old blood glucose meter test strips? People with diabetes will know to dispose of their blood strips in the same waste container as the other sharp objects used as part of their diabetes testing supplies. They can also be kept in a sealed bag to be disposed of later. Many strip brands will also give instructions on how or where to dispose of their products. A glucometer is essentially another term for Blood Glucose Meter. Can I use a test strip more than once after testing? You cannot and should not use the same test strip for testing twice. The strips are designed for a one time use only and must be safely disposed of after. Instructions on using test strips are usually inside the box, so make sure you read them before using the strips. Should medication be taken before glucose testing? It really depends on what kind of test you are going for. If you are doing an at-home test, unless otherwise indicated by your doctor, you would be taking your medication as prescribed daily at the same average time. It is important to speak with your healthcare provider about medications, especially if you are thinking about stopping to take it. If you believe that any prescribed medication is affecting your results, bring it up with your doctor. Why is the finger used for checking blood sugar? Because there are lots of blood capillaries close to the surface and it’s an accessible area, it’s easy to draw enough percentage point of blood from a finger rather than other parts of the body. I’ve heard of Dexcom in so many websites. What is it? Dexcom is a company that not only distributes diabetes-related continuous glucose monitoring systems but it also develops and manufactures them as well. Dexcom products can be used other pumps, such as the Omnipod. The best glucose monitor I’ve seen is the Bayer Breeze 2. This is because it has 10 “strips” on one disc. Is it your diabetic council that has the free ebook that keeps popping up in my smart phone when I use your webpage or is it another ad. I agree the Breeze 2 is so easy to use and great if you have arthritis, only problem you can not get test strip strips since March 2018. Is there any Glucose meters that can be used with a one handed person or at least the easiest that the test strips can be inserted with 1 hand. My experience is that it is one of the worst. The only advantage it has is that the strips are cheap. Livongo meter shows blood sugar levels consistently lesser by 20 points or so compared to One touch ultra mini and Freestyle lite meters that I also have. One touch and Freestyle lite give identical results. So if I check in Livongo and the result is 65 my blood sugar level is actually around 85 which is what it should be. But then Livongo gives all kinds of silly messages if the result is 65 which is absurd, because the blood sugar levels are actually 85 and is normal. This is the only flaw in Livongo because it shows consistently around 20 points lesser than it actually is. This is in continuation of my earlier post. I beginning to have doubts about the accuracy of Livongo meter. It shows a whole lot less points than the other two I mentioned. It is not just 20 less as I said earlier but sometimes even 40 to 60 points lesser than the other two. I don’t trust Livongo results any more if it says my blood sugar is 64 when the other meters I mentioned say it is 123 and 118. If anyone else is using Livongo I would appreciate their feedback. My Livongo meters are new (I have 2 of those ) and the control checks on both are within range. Thanks. I tried the Livongo and it always read me 20+ above what my meter would say. I gave up. My free Livongo glucometer has been reading 40 points higher than my original Accu-Chek Aviva Plus that was prescript by my Doctor. I was testing using both but now that I found out that my Accu-Chek Avia Plus is the second most rated glucometer. Free is not always good. As a certified diabetes educator I see at least a dozen diabetic patients every day at clinic and then another dozen at hospital. I’ve heard all the complaints about different glucose meters. And here is what I have to say: None of the meters out there come close to One Touch Ultra 2. Don’t take my word for it, check this page on Amazon there are over 200+ positive reviews. your “pick” was tested and is only accurate 70 percent of the time. Sounds like you are picking whoever pays for it. way to give false information for peoples health, but I’m sure your check cleared so what do you care. I am sorry to say this but TheDiabetesCouncil.com doesn’t accept any money. I know this was not the answer you were expecting but that is the only answer you are going to get. The fact that you have zero knowledge about me, my experience, my background and my expertise in diabetes is enough to tell me that I should let you go and not educate you any further. Next time, if you post on this site make sure to get your facts right. I know you are angry and I know you are mad and I suggest you take this fight to multi-billion dollar pharmaceutical companies. My diabetes educator specifically told me I should upgrade from the Ultra 2 because it’s less accurate than current standards. 1. Make sure the lancet you receive doesn’t bend, if it does then call Bayer. 2. There could be some discrepancies in the reading levels so make sure you check few times. Because I have heard some people tell me that it is not accurate. I have to tell you that I have a lot of friends and I see a lot of people that use Contour Next EZ and I have never heard any complain. But readings could be little off but it’s still the best. 3. Test the device to make sure its not faulty, I suggest this for every bg meter. 4. I recommend you get the kit and not just the meter, as it will come handy. 5. You will hear people say it’s hard to use but this meter is really easy. 6. Make sure the batteries are not dead, it could be a reason it’s not working. 7. Make sure the items are not expired that is the test strips and the lancets. 8. This meter is for human use and not animals, I have had people use it for their dog. Do not buy this for your pet. 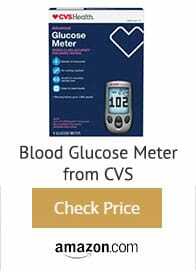 I have done extensive research on bg meters and I have read tons and tons of reviews, Contour has the best ratio of overall customer satisfaction in blood glucose meter industry. It’s 15 to 1. For every 15 customers there is one unhappy and as I said it’s mostly because people do not test the items in the package. One Touch Verio meter state Accuracy “Failed FDA testing”. Can you explain what it does mean?? My child is using that meter. and It looks so negative to me.. thanks!!!! what does “DTS passed accuracy” mean? Also a +/- % range for each one would be nice. I have checked hole blood of a diabetic person with two type of glucose meter along with their strips from the same punching point but result are different (1) Dr. Morphen bg-3(2) touch one. How is it all are bogus it seem to me. What and who are DTS are they affiliated by ADF or by W. H. O ? Which brand of blood glucose meter do you use? We recommend the #1 on our list and that is what I always recommended to people with diabetes. Well, it seems odd that you are touting the accuracy of the one touch verio when it failed DTS? How does that work? It was requested by many users that we review Verio as well. Why is freestyle insulinx not in the list? It’s the best blood glucose meter as far as I remember. You could test your levels with a drop of blood. I find it even better than onetouch ultrasmart. You should also write about “alternative site” to test. They must have raised their package price. What is the difference between CONTOUR NEXT meter and CONTOUR NEXT EZ meter? Which is better? For all the professionals who never test their blood sugar 4-6 times a day, day after day, year after year. Consider alternate site testing. I’ve been using Freestyle successfully for the past 20 plus years. I challenge any non testing professional to use a finger only source of testing for one month and see if their opinion changes. Freestyle, a heck of a lot less blood required and you can test fingers, palm, forearm and upper arm. Wal-mart no longer makes the relion confirm, any of it strips tester nothing anymore.